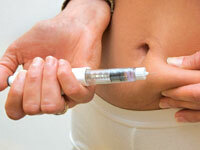 Injecting insulin above and to the side of the belly button can result in more consistent results. There's no simple way to tell when a patient with type 2 would do best on insulin, says Richard Hellman, MD, former president of the American Association of Clinical Endocrinologists. But there are guidelines. "In general if a patient has a hemoglobin A1C that is higher than the agreed upon goal and they are not on insulin, we recommend insulin therapy," Dr. Hellman says. The American Diabetes Association (ADA) recommends an A1C of 7% or below, and the American College of Endocrinology and the American Association of Clinical Endocrinologists recommend an A1C of 6.5% or below. If you can't lower your A1C with diet, exercise, or other medications, you may need insulin to do the job. There are exceptions, of course. Someone who otherwise seems to be a good candidate for insulin may not be able to manage such a regimen if he or she has limited vision and dexterity and no family support. If you do need insulin in the short- or long-term, your doctor may prescribe one of four different types. These vary by how quickly or slowly they reach the bloodstream (the onset), the amount of time they work at maximum strength (the peak time), and how long they continue to be effective (the duration). The different types of insulin mimic the natural rhythm of a healthy pancreas, which produces a consistent low level of the hormone and occasional bursts of insulin to cope with postmeal boosts in blood sugar. According to the American Diabetes Association (ADA), your need for insulin is based on several factors. In type 2 diabetes the body is resistant to insulin. The beta cells in the pancreas churn out insulin as fast as they can to overcome this insulin resistance. This Herculean task can eventually exhaust the beta cells and diminish their ability to produce insulin, potentially resulting in them being unable to produce any insulin at all. Although early treatment to reduce blood sugar can help save the beta cells, diabetes is a progressive disease. Sometimes, particularly if diabetes is diagnosed a decade or more after its onset, the beta cells are too far gone to salvage, and you may need to take insulin permanently.